Increasingly, IT teams are challenged and too under-resourced to successfully overcome some of the security gaps in virtualized and hybrid cloud environments. And the lack of visibility into infrastructure and workloads in the cloud further complicates how security professionals reduce risk and stay compliant. -Gain complete visibility into application flows to eliminate blind spots. -Apply consistent security policies across heterogeneous environments. -Detect breaches in real time by detecting lateral movements to prevent data loss. -Reduce security management complexity inherent in hybrid cloud. 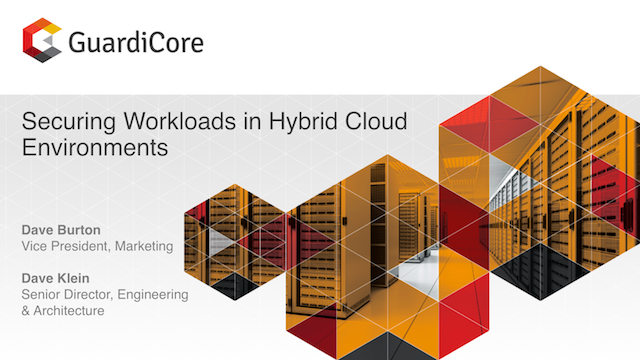 Learn how GuardiCore enables consistent and scalable security for all workloads via a single platform providing visibility, micro-segmentation, breach detection and response. Micro-segmentation provides greater visibility and control in data center and cloud environments, but how effective is it and how easily can it be adopted? Micro-segmentation can be difficult to execute in dynamic infrastructures and at cloud scale, where workloads are communicating and often migrating across segments. Watch this webinar to understand how to optimize micro-segmentation policy and fully realize its benefits over the traditional network security approach. The container ecosystem is constantly changing and evolving, yet enterprises are still trying to find the most effective ways to ensure security and compliance. Containers and orchestration systems use numerous technical abstractions to support auto-scaling and distributed applications that obfuscate visibility into application communication flows, however in this process, security teams lose visibility into application communication flows, rendering traditional tools useless and exposing the application to risk. Does your organization have a data breach response plan? Discover the best practices for breach response and how to strengthen your organization's cyber resilience. The explosion of cryptocurrencies and their fast-profit potential have given rise to the phenomenon of cryptojacking - the latest trend for criminal hacking organizations focusing their resources on hybrid cloud data centers. In doing so, augmenting their illicit revenue stream by tying their hijacked resources to cryptocurrency mining. Join our webinar to learn how threat hunters and security analysts can successfully secure large and complex enterprise networks. We’ll discuss challenges unique to immense networks, such as lack of accurate information, poor visibility and how to improve security without impacting operations. Today’s applications that handle payment card information are complex, dynamic and operate across different infrastructures, operating systems, and even physical locations. In many cases, these applications auto-scale to support usage spikes and are constantly updated with enhancements and new features. Given this complexity, ensuring and demonstrating compliance with the Payment Card Industry Data Security Standard (PCI DSS) is extremely challenging. Security teams face numerous difficulties with implementing the standard including identifying and scoping applications, segmenting them and detecting threats. Today's ever changing IT environment for applications and workloads presents new security challenges. The GuardiCore Centra Security Platform protects critical assets in any cloud or data center environment, enabling organizations to reduce risk, stop advanced threats and meet compliance requirements. See how Centra can help your IT team define, monitor, and enforce micro-segmentation policies to isolate workloads, stop lateral movement and contain active breaches, all without impacting network or system performance. Enterprise cloud customers know they need to further segment their applications and workloads in order to detect and thwart threats in real time before they can do any damage. Given all of the obstacles, it’s not surprising that most micro-segmentation projects tend to suffer from glacial implementation cycles, exceed budgets, drain resources and ultimately fail to achieve their goals. Chances are, you and a lot of people you know could be a few of the 143 million consumers affected by the major data breach recently disclosed by Equifax. The GuardiCore Centra Security Platform provides the five critical capabilities needed to secure workloads in modern data centers, clouds and hybrid architectures: flow visualization, micro-segmentation, breach detection, automated analysis and response. Monitoring all connections, Centra discovers and tracks process-level activity and correlates it with network events, providing security administrators with a dynamic visual map of workload communication flows. Multiple breach detection methods discover malicious activity faster and with greater intelligence. Centralized management accelerates threat investigation, mitigation and remediation. With Enterprise-grade scalability, resiliency and performance, Centra integrates with all major virtualization and orchestration platforms and public cloud providers. stop advanced threats through real-time breach detection and response. Developed by the top cyber security experts in their field, GuardiCore is changing the way organizations are fighting cyber attacks.